With less than a week to go until 2018 -and with not procrastinating as a key Habitat Habit for the year- here is the first edition of Habitat Habits a few days ahead of time. Habitat Habits will be regular posts sharing actions you can take to be happy and healthy. Subscribe to the blog or follow us @findhabitat on social media for information and inspiration that will help you thrive. Ha’barn’tat at Habitat. 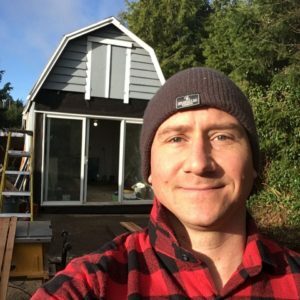 All the creator comforts to create and recreate in your own private tiny home. This first post is inspired by my goal to overcome some chronic pain from tendonitis and inflammation I have been dealing with over the last few months. Starting the makeover at Habitat with a sprained wrist must not have been a good idea but it had to happen. Dozens of hours of painting, sanding and tiling coupled with typing away at the keyboard and scratching for a few waves in the ocean has culminated with some nagging aches in my wrists, elbows and shoulders. It will be worth it when everything is done though! Curcumin is a great anti-inflammatory molecule but it needs help to get into your bloodstream and cells. Black pepper contains piperine. By inhibiting the water solubility of curcumin (and other nutrients and drugs), piperine increases the bioavailability of curcumin up to 2000%! 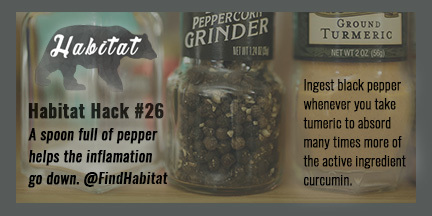 Add black pepper to any food you are looking get more vitamins and nutrients out of (warning you do need about a tablespoon worth to have any effect). Don’t want the peppery sting in your turmeric mango smoothy? Swallow a few whole peppercorns. 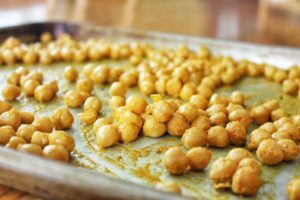 Use the Crunchy Turmeric Curry Chickpea recipe below to make a healthy snack for your New Year’s Eve or New Year’s Day party. Turmeric is considered a superfood and includes Curcumin, a natural anti-inflammatory and antioxidant. This recipe includes a healthy dose of black pepper which contains piperine to boost the absorption of curcumin. 1. Preheat oven to 400 degrees F. Place chickpeas in a medium sized bowl and pat dry with paper towel. 2. Season with salt, pepper, turmeric, nutritional yeast, cayenne and olive oil. Toss well until chickpeas are well coated. 4. Remove from sheet pan and put in a bowl for serving! Habitat is a work/stay/play/thrive retreat in Ucluelet near Tofino, BC. Ucluelet means “people with safe harbour” and has long been an environment that generously provides the protection, nourishment and beauty for people and animals to thrive. Designed specifically to support your ability to create and recreate, Habitat is a healthy and inspiring environment crafted for periods of optimal productivity, fun and rest. Book your change-cation to write that business plan, study for an exam, or achieve balance between productive output and restorative hiking, surfing and foraging. Follow us @findhabitat on social media for information and inspiration that will help you thrive.